No FHF...on the road for the General Finishes Flippin' Furniture Expo! No Free Hardware Friday, sorry! 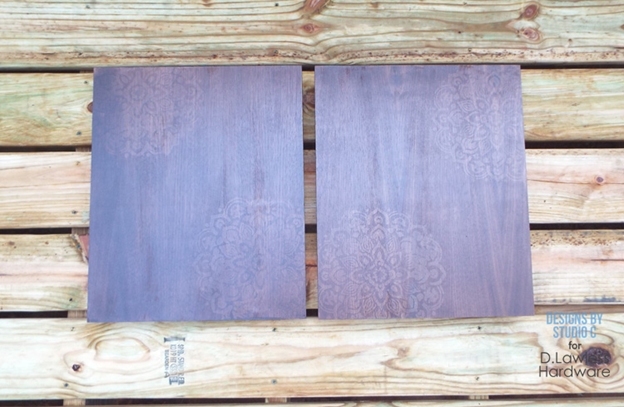 We are traveling and getting ready for the General Finishes Flippin' Furniture Expo! Join us! 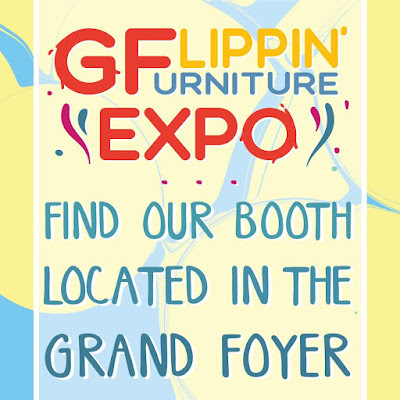 D. Lawless Hardware will be joining General Finishes at their inaugural Flippin’ Furniture Expo located at LOEWS Hotel in Rosemont, IL Oct. 30th – Nov. 1st. The GF Flippin' Furniture Expo presents an exciting opportunity for attendees to learn hands-on finishing techniques, build business skills and network with industry professionals. Learn all about this fantastic event here! Hope to see you there. THIS PROMOTION HAS ENDED. PLEASE COME BACK NEXT WEEK! It's been a couple of weeks since I did a Free Hardware Friday. There are only my brother and I working on the website and we've got big plans so we are pretty much swamped with what basically amounts to grunt work adding products and photos. 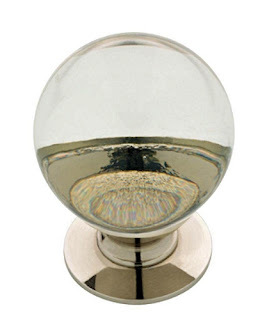 BUT...the wait is worth is as we have probably the nicest piece of hardware we've ever featured on Free Hardware Friday in this smooth glass ball knob from Liberty Hardware. It's got a polished nickel base and is currently on sale at Home Depot for nearly $6 a pop. I'll take a moment to plug other small businesses on the web. If you want a good price, shop around! The corporate sites are (in a high percentage of cases) RIP OFFS and if you search page two or give a small timer a chance you stand to benefit from better prices and MUCH BETTER SERVICE. 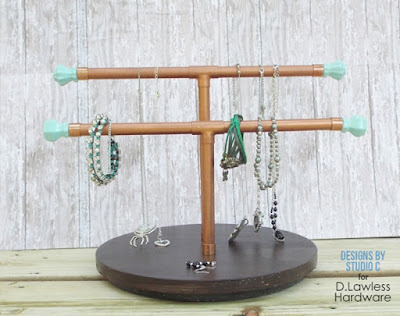 This easy to make jewelry holder utilizes Lazy Susan hardware with copper pipe for jewelry holder with an industrial look. There are no fancy tools required to make it, either! 2 - 1/2" copper tees. 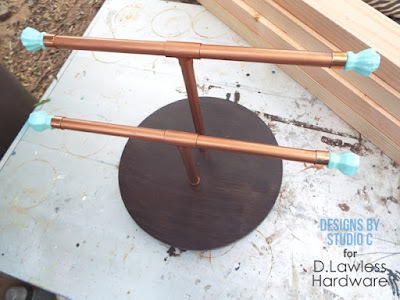 #8-32 machine screws, 1 1/2"
5 - 1/2" copper pipe at 6"
1 - 1/2" copper pipe at 9"
Spray paint the knobs as desired. 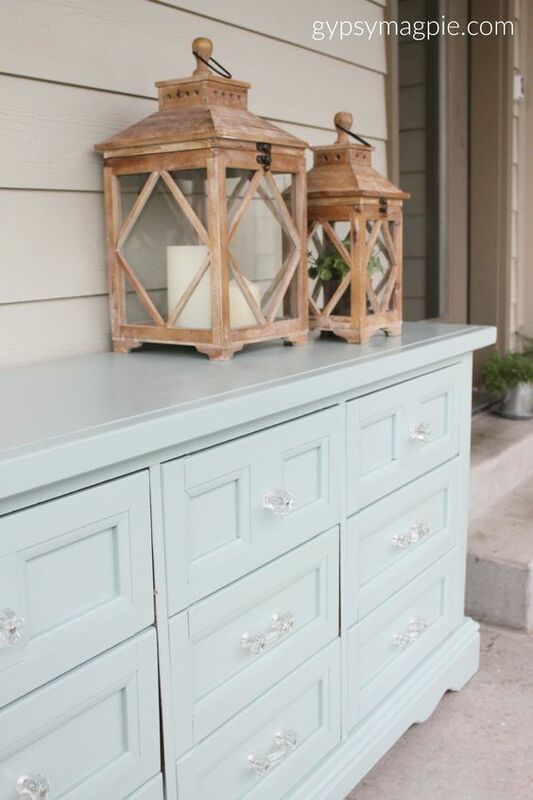 I used a Milk Glass spraypaint in a vintage aqua color for the knobs I used. Drill a hole in the center in each of the six ½” copper pipe caps. Thread a machine screw through the top of the glass knob then through one of the pipe caps. Secure the knob to the cap with a nut on the inside of the cap. Cut the pieces of pipe to length. Using the pipe cutter is really easy – make a mark on the pipe at the length desired, then align the blade of the cutter on the mark. Tighten the knob on the cutter so that it is snug on the pipe then turn the cutter around the pipe. Tighten the knob a bit then make another pass with the cutter. Continue until the cutter cuts the pipe all the way through. 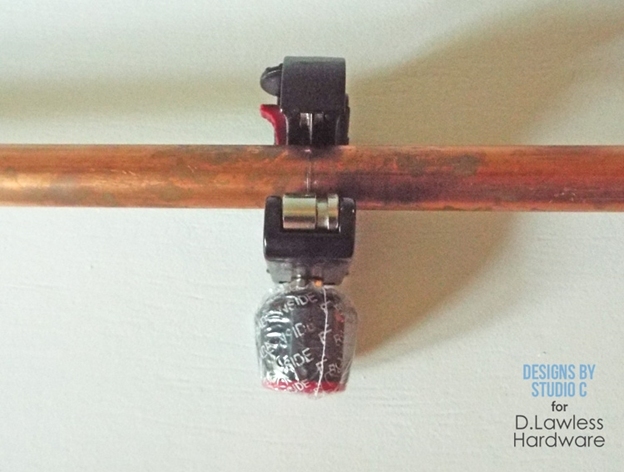 Apply a bit of adhesive to one end of each piece of pipe and insert the pieces of pipe into the tees. The “arms” of the jewelry holder will be the 6” pieces and the “stands” of the jewelry holder will be one 6” piece and one 9” piece. 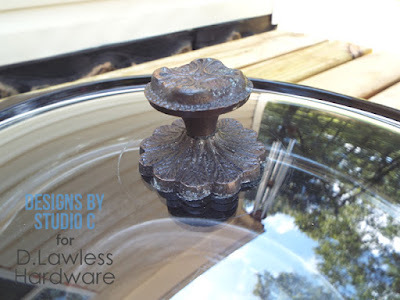 Secure the caps with the glass knobs to each “arm” using adhesive. Stain or paint the round piece of wood, as desired. 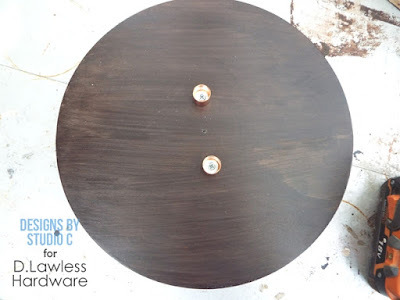 Position the Lazy Susan hardware on the bottom of the wood and secure in place with one ¾” screw through the center. 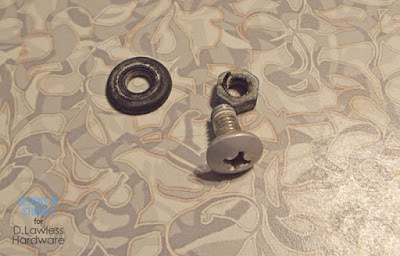 Secure the remaining pipe caps to the wood with a ¾” screw and a washer, approximately 1” from the center. This will make the two sections of pipe 2” apart. 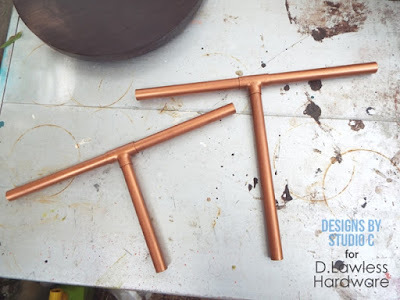 Apply a bead of adhesive around the outside of the “stand” portion of the pipe assemblies, then insert the pipe into the caps. 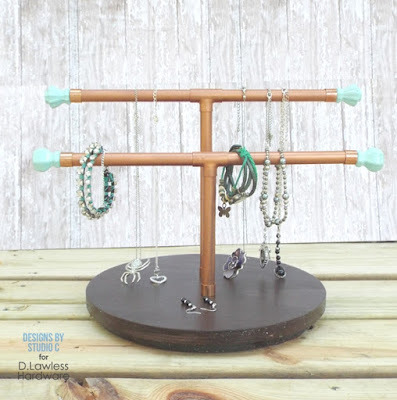 This jewelry stand can also be made with PVC pipe which is a little less expensive and it can also be spray painted any color. The stands also make a great gift! These art frames are not traditional in any way, yet they are super-easy to make! 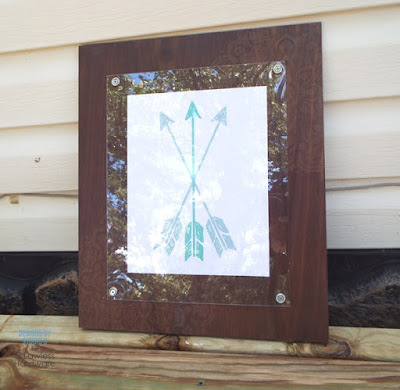 These frames are made with a plywood base, which has been stained, then finished off with a piece of Plexiglas secured to the base with finish washers and screws. 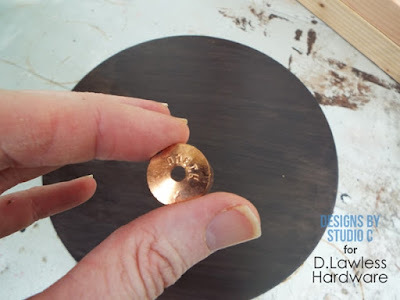 Finish washers are cupped washers that add a decorative or “finished” look to screws that will be exposed. 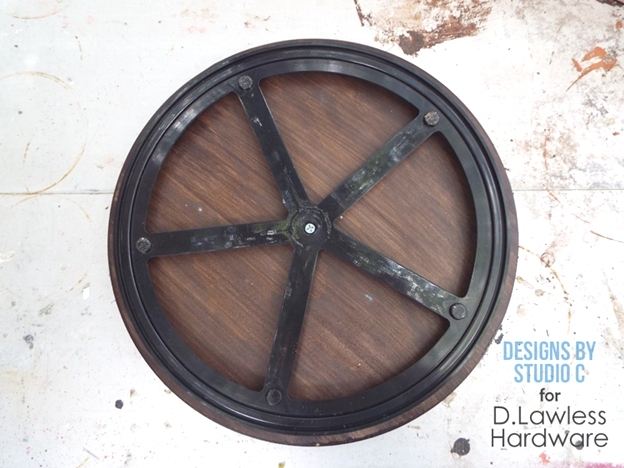 They usually come in a chrome finish and can easily be spray painted to suit the project. The plywood can be purchased in 2’ x 2’ or 2’ x 4’ sheets. Most home improvement stores will cut them to size for you at no or minimal cost. Start by sanding thoroughly sanding the plywood using 150 grit sand paper followed by 220 grit sandpaper. 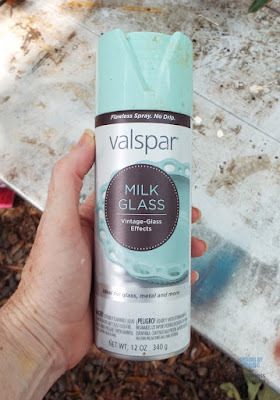 Stain or paint the plywood as desired. 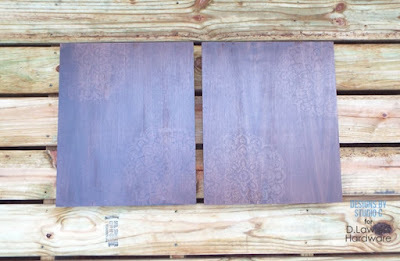 I used a stencil and a glue-resist technique on the plywood piece, then stained it using a dark brown stain. I finished with two coats of a polyurethane sealer. 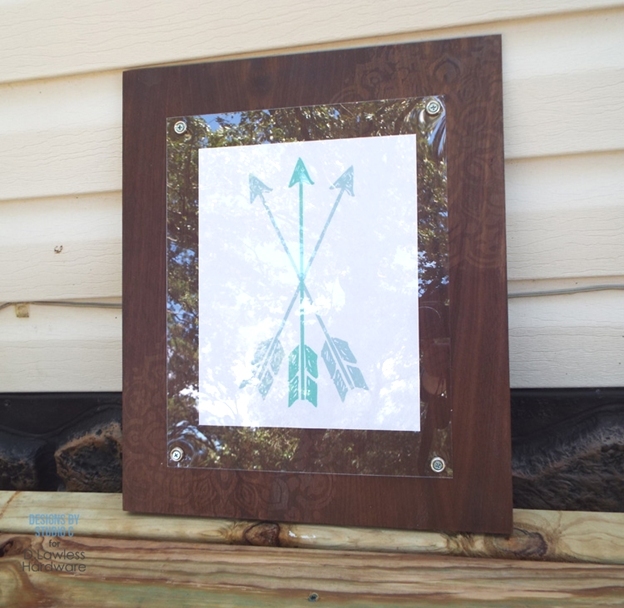 Next, position the Plexiglas sheet on the plywood piece with a 1” border around all sides. 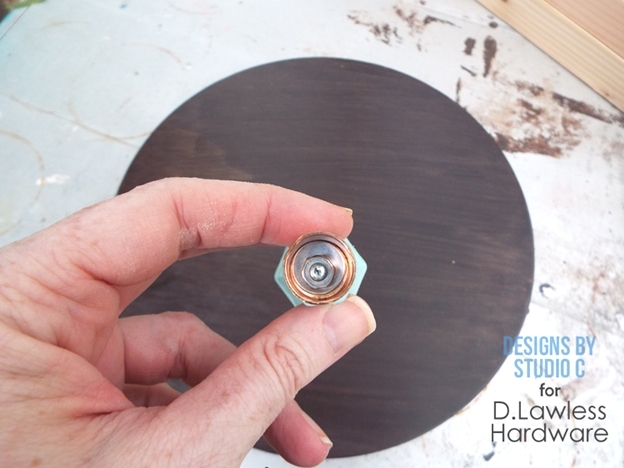 Use a drill with a 1/8” drill bit to drill holes in each corner of the Plexiglas approximately 1/2” in from each end. When drilling holes in Plexiglas, use very gentle pressure or the Plexiglas will crack. Do not drill all the way through the plywood base. Thread a finish washer over the end of each screw, then carefully drive the screws through the holes in the Plexiglas into the plywood. 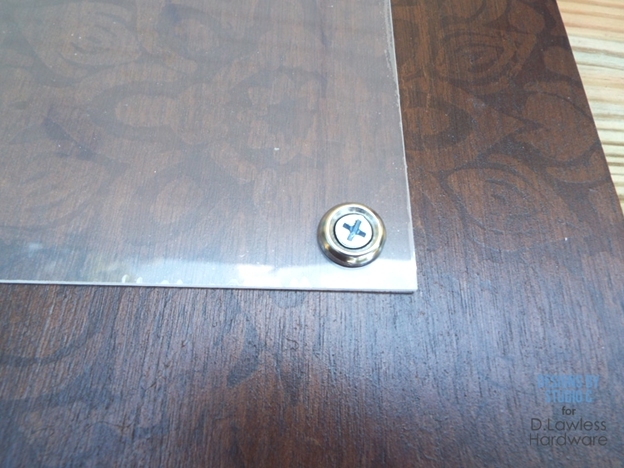 Do not overtighten the screws because this will also crack the Plexiglas. Insert the photo or artwork desired prior to securing all of the screws. 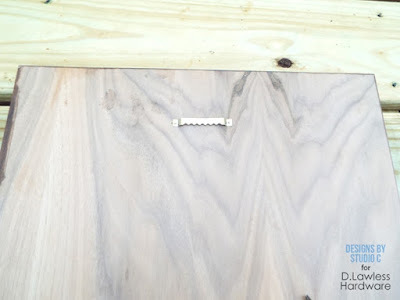 Install a sawtooth hanger on the back of the plywood base. 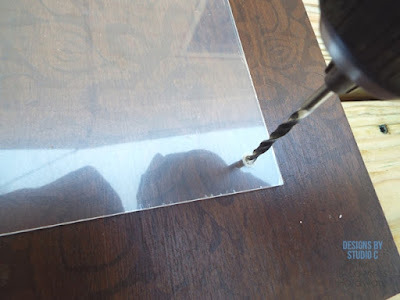 Plexiglas can be purchased in large sheets at any home improvement store then cut to the size desired using a straight edge and a utility knife. A great idea would be to create a really large frame then add photos in a collage! 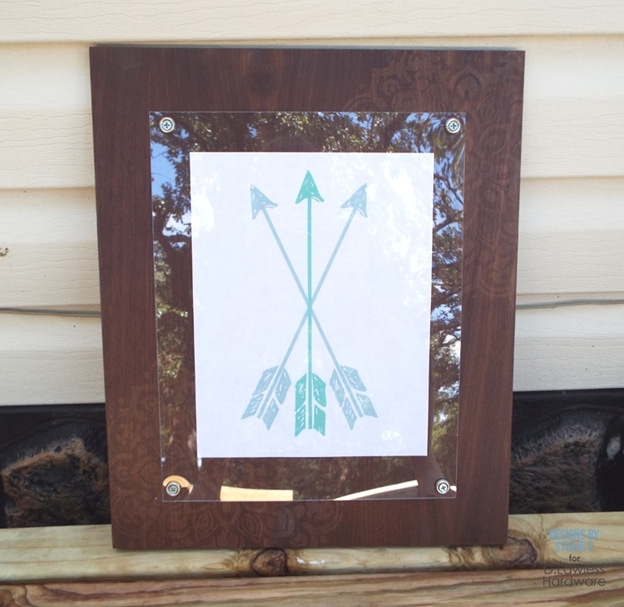 With the holidays coming up, these frames will make great gifts and several can be made inexpensively! Sometimes people have great ideas on how to pretty up everyday things around the house using our hardware and this one from Designs by Studio C is a great example! Personalize your slow cooker with something that's more your style than the little plastic handle! 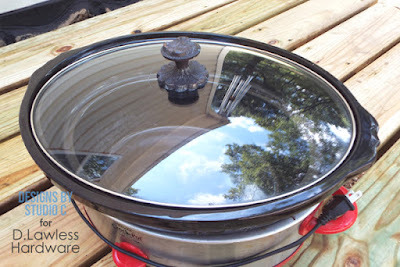 Like most people, I am a huge fan of using a slow cooker to make meals. It doesn’t get any easier – put the food in and turn it on, and a few hours later dinner is served. 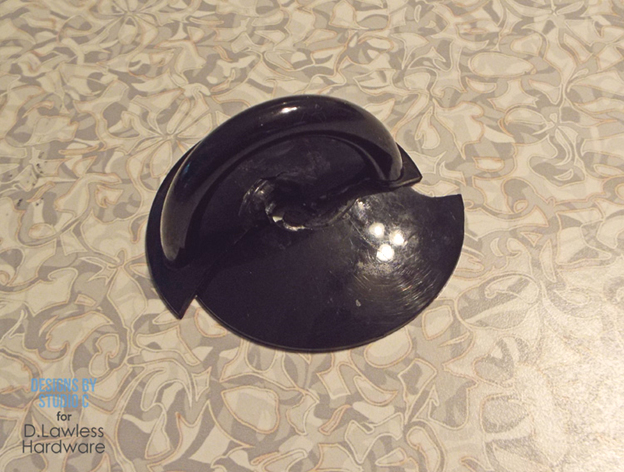 It all came to a halt when the handle on the lid of my slow cooker broke. I didn’t want to spend the money on a new lid plus I wasn’t really sure where I would find a new lid! I found that a drawer knob works perfectly as a new handle on the lid! I started by removing the pieces of the old handle on the lid. 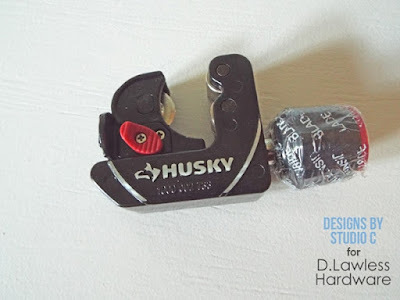 The handle was held in place with a screw and a rubber washer. I dug through my stash to find a knob that I thought would fit and look really, really cool (I’m into that!). 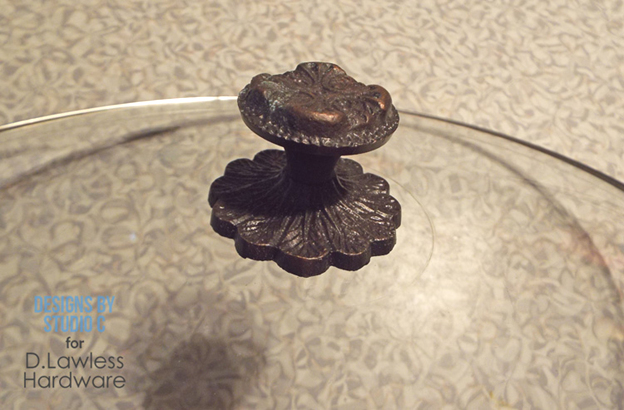 I came upon a metal drawer knob with a matching escutcheon plate that I bought years ago. The next trick was finding a #8-32 machine screw in my stash that was short enough to make the knob and plate fit snugly against the lid. I found a ¾” #8-32 machine screw that fit into the end of the knob perfectly. I threaded the screw through the rubber washer that was originally on the lid, then threaded the escutcheon plate and knob on the machine screw. I made sure the screw was snug but not too tight so that it interfered with the natural expansion and contraction of the heat of the lid. I love the way it looks but the only bad thing is that the knob gets a little hot. To me, that is a small sacrifice compared to trying to find a new lid! 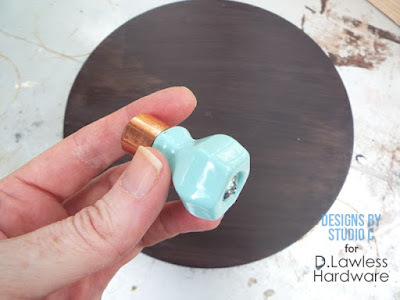 Any style of drawer knob can be used - a porcelain knob may also work and may get less hot, but I would definitely avoid a plastic knob as it may melt! 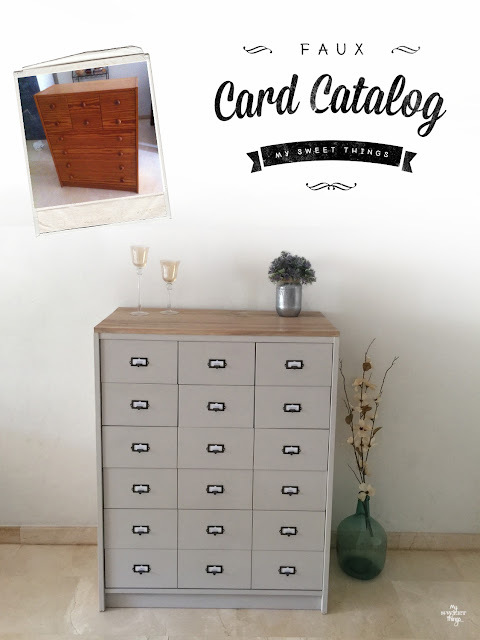 We are proud to have worked with tons of different blogs in their furniture makeovers. 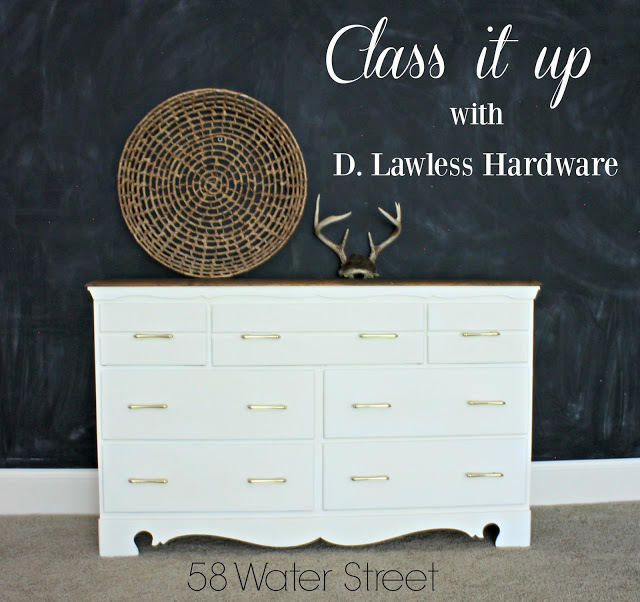 Today, we are going to take a look at the wonderful variety of dressers with our hardware featured. This piece was in structurally excellent condition and was solid mahogany. After some sanding and a new mid toned gray paint job, the two top drawers were stained creating an intriguing contrast of colors. 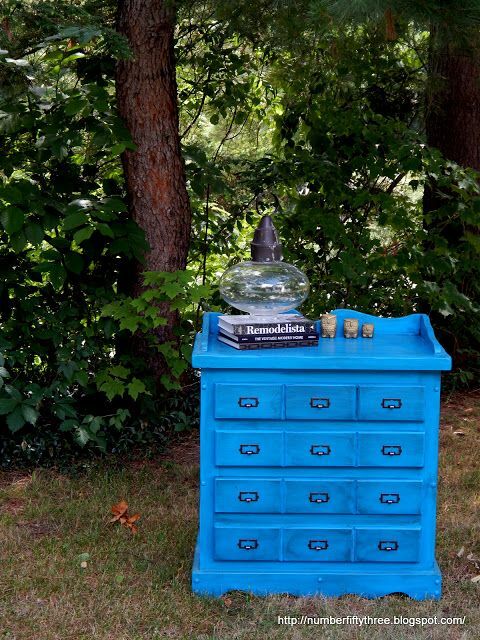 From Number Fifty Three, learn how this piece comes together with our sun aged glass knobs providing the final touches. Hand painted in the prettiest blue-green this color is called Wythe Blue by Four Chairs. Going for a hand me down look, Gypsy Magpie wants this piece to look like it was inherited from Grandma's house. Our clear glass knobs help match the hardware with the aged look and feel Missy was going for. 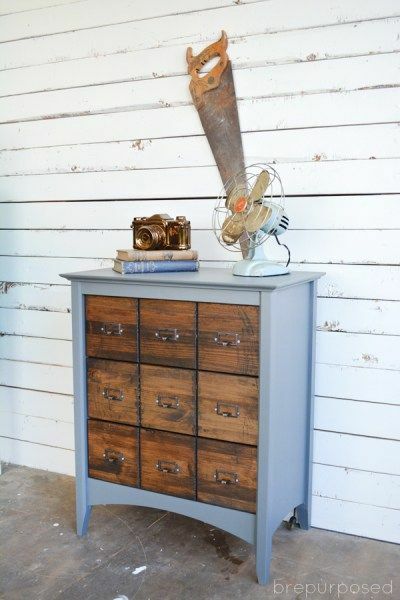 In Stacey's words, this rustic glam dresser in trophy is perfect. Trophy is such a great grey. Reminiscent of the grey on a plaid wool blanket you wrap yourself into on a crisp fall day. 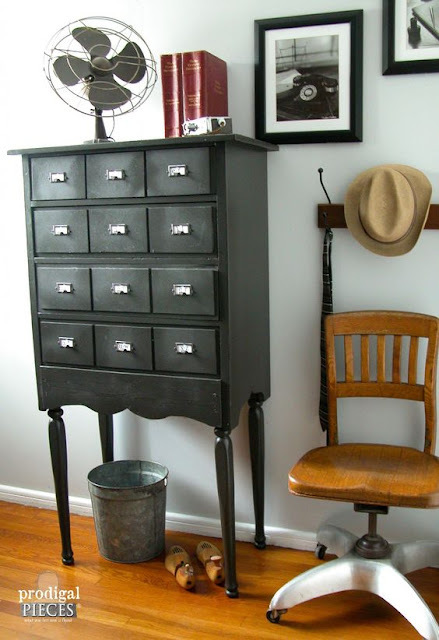 The dresser already had a terrific grain to go with the grey and our bail pulls help match the theme of the piece. See the whole makeover at Stacey Embracing Change. Classing it up, 58 Water Street goes with a stained top and white paint job to create a nice contrast. Combined with out satin brass pulls this piece is simple yet elegant. 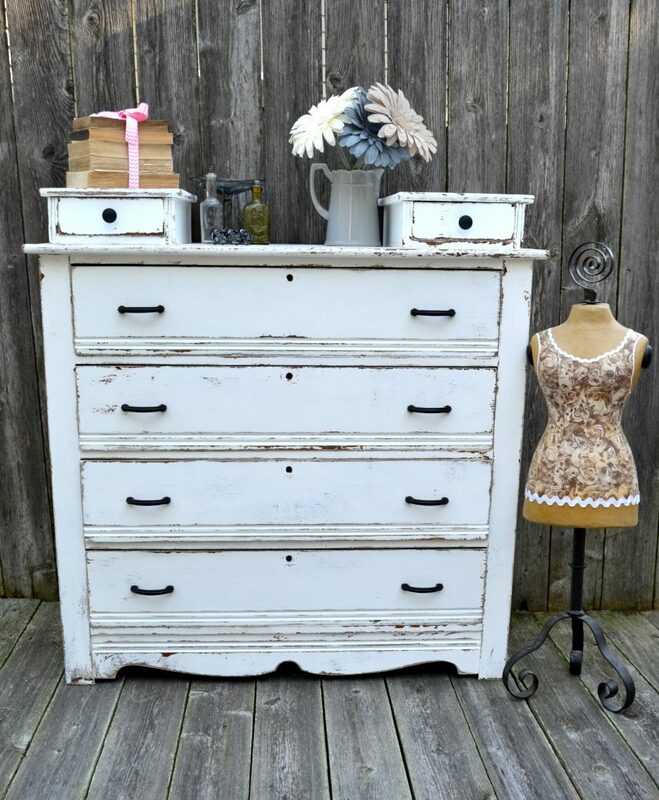 Shopping yard sales for farmhouse decor, My Creative Days presents this "Picket Fence" white farmhouse dresser. Goes to show that you can find a little bit of gold if you take the time to search through the trash. 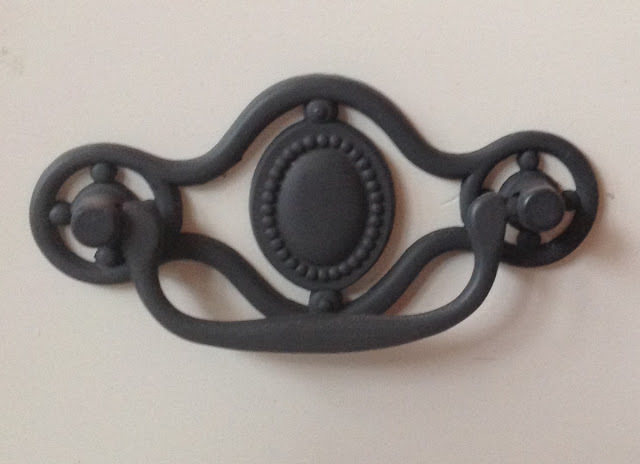 The perfect finished look is all Lindsay, but we did provide the contrasting black knobs and pulls for the project. 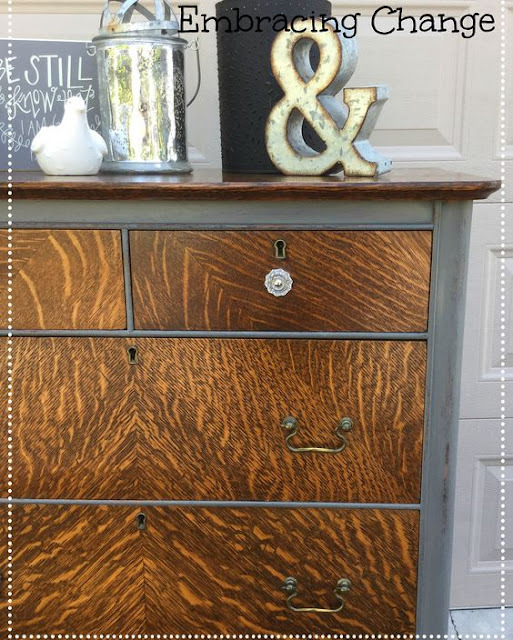 Refreshing this dresser in a similar style as it once was, a stain based makeover was in the works over at The Painted Hive. In a how to stain a timber video tutorial, you can check out all the details that made this piece. 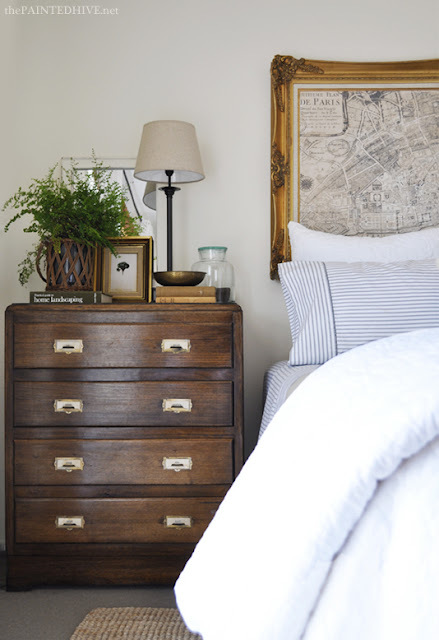 And don't forget those gorgeous brass label pulls featured. In a regal appearance, barn door red meets metallic bronze. 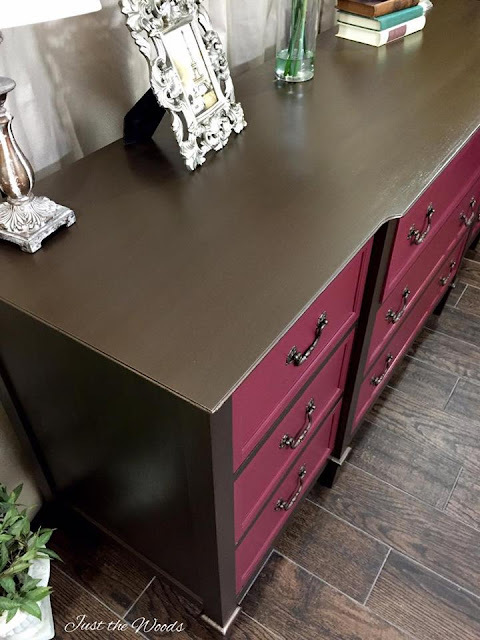 Just the Woods hand painted this dresser in tanner brown and then glazed with bronze hardware opulence. Our hardware also had a change in color. The ornate satin pewter bails pulls were turned into a bronze to match this piece. For this piece, Vintage Refined started by painting two coats of French Linen over the entire buffet. Not sure what to do next she started experimenting. To freshen it up, the wash technnique was used with Old Ochre. The overall effect reminds me of a distressed wood look. The bail pulls were provided in brass but had a spray coat of oil rubbed bronze used on them. 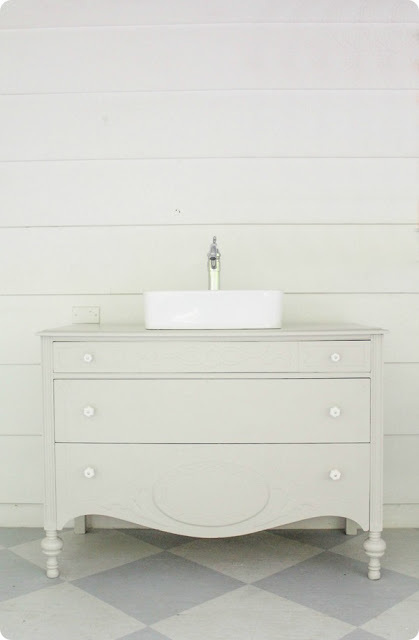 Learn how to create a beautiful bathroom vanity from a vintage dresser. 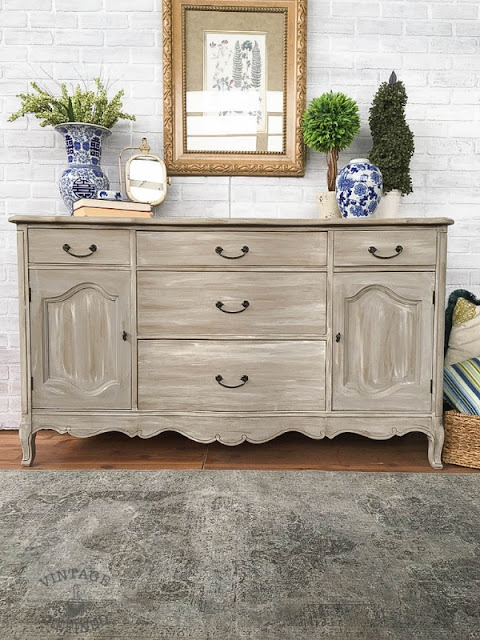 Lovely Etc shows you an extremely inexpensive way to get a custom vanity that looks expensive on the cheap. The milk white glass knobs courtesy of us. A huge labor of love went into this project. 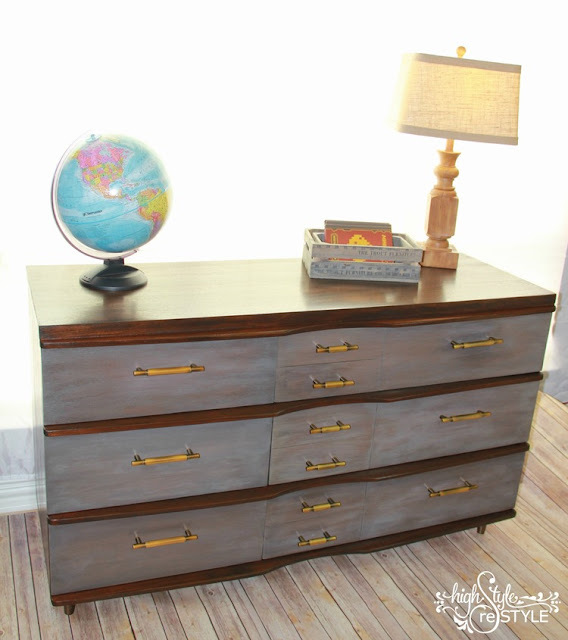 You'll want to see the before and after photos for this mid century modern dresser makeover. The contrast between the dark body and the driftwood drawers makes for a great combination. High Style Restyle uses our bronze pulls to put the finishing touches on this piece. 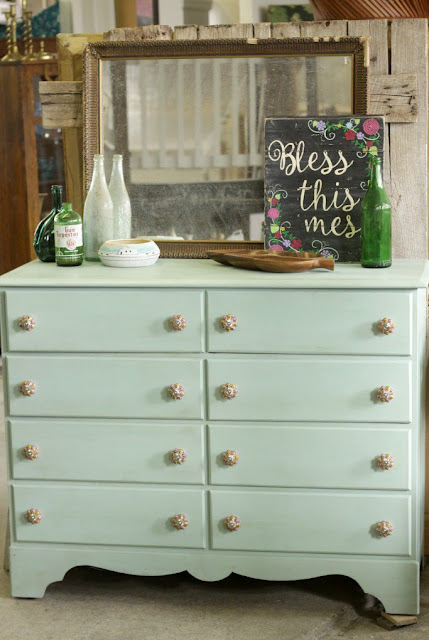 Cassie Bustamante shares this sweet mint dresser with us. With a Rifle Paper Co palette, these colorful hand painted pink knobs were used to really makes the piece pop. Too see how the depth and character were put into this piece click on over. We hope you found some inspiration along the way. 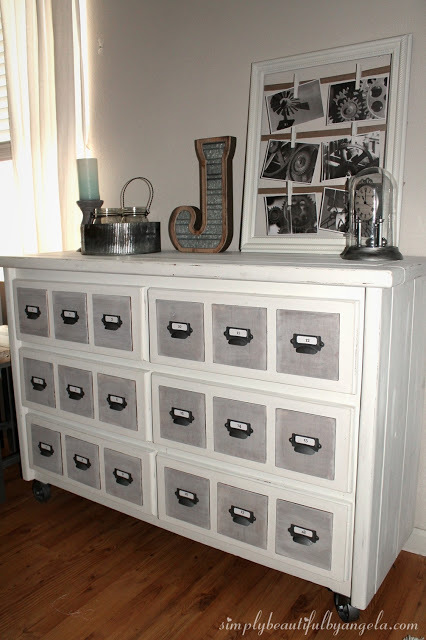 Those were some fabulous dresser makeovers to check out. We are proud to have provided the hardware for each and every one of these posts.